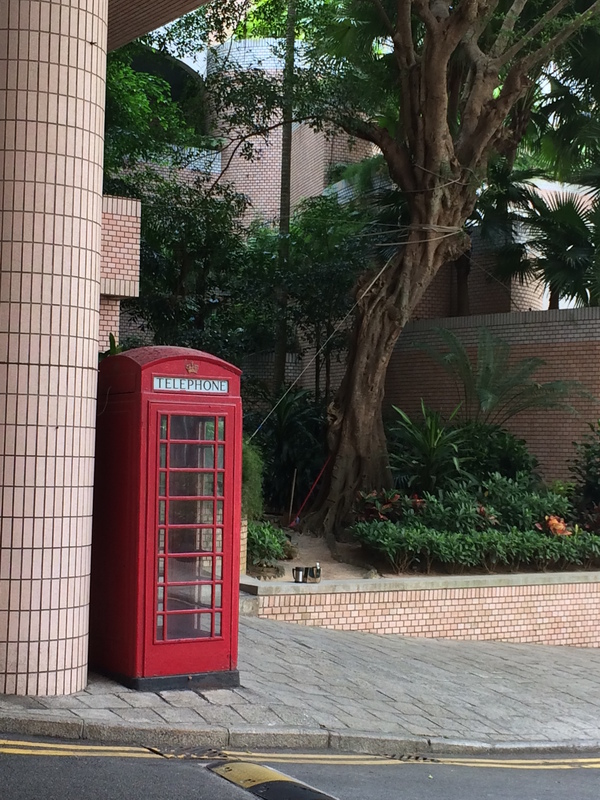 We live in a complex called Hong Kong Parkview on the top of Mount Nicholson in an area variously known as Tai Tam or Repulse Bay (or “Resolute Bay” as Paul sometimes calls it). 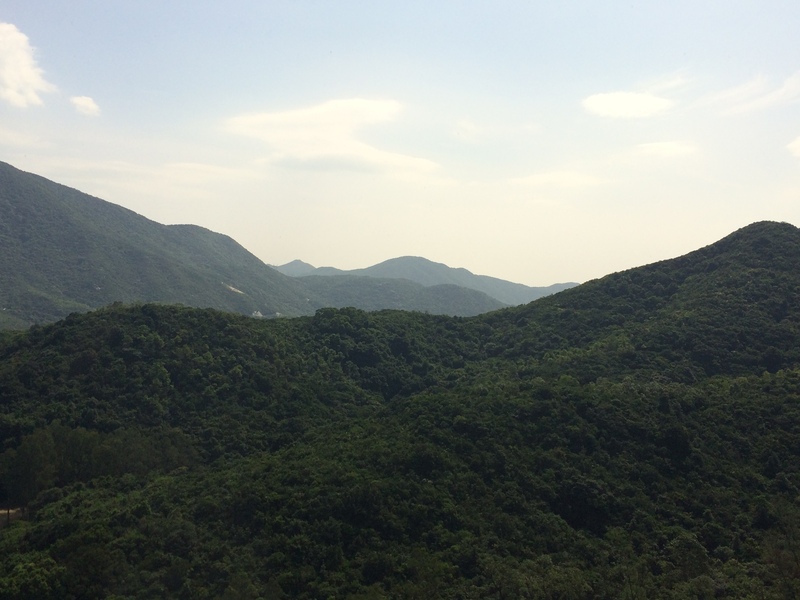 We are surrounded on three sides by Tai Tam Country Park. 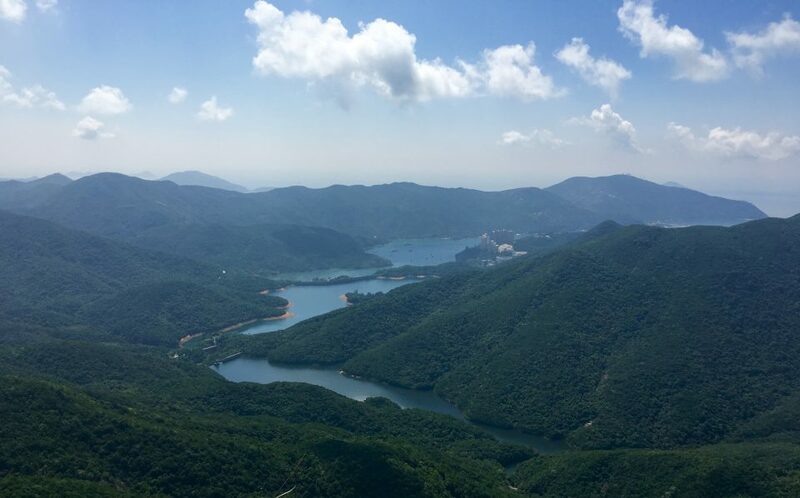 It is a lovely 15-minute walk from here down to the Tai Tam Reservoir and there are numerous hiking paths virtually at our doorstep. 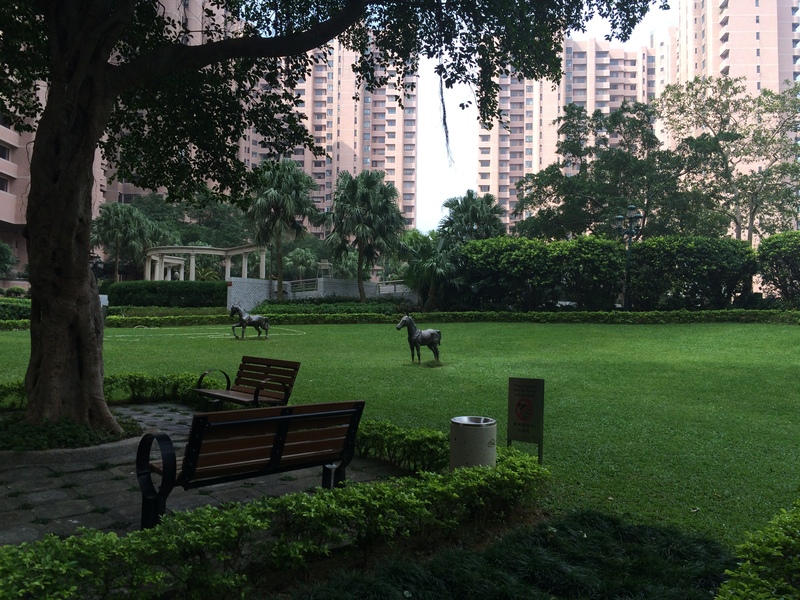 Our complex is a cluster of 18 towers in an area of 55,000 square meters. Each tower has 20 floors although the elevator numbers go up to 23. (There are no 4th,, 13th or 14th floors here, at least they don’t call them that.) There are about 1,000 suites, including 780 residences and 220 suites which are part of the two hotel/serviced apartment towers. Approximately 3,000 people live here. There are a lot of expats, particularly French, going by what I hear around me, and about 500 people work up here, employed as grounds-keepers, security, restaurant staff, hospitality, facility maintenance and so forth. The view from our apartment window. Although we are on the first floor of suites, it’s actually about the fifth floor of the building and the mountain drops right out behind us. Our apartment is at 305 metres above sea level. Ottawa, Canada, where we are from, is 70 meters. Here we can open our windows and hear the birds sing. The air is fresh and about three degrees Celsius cooler than in town. And on that note, the weather has been beautiful for weeks: sunny days, about 25-degrees and low (around 75%) humidity. It’s lovely at this time of year here. The complex, which was built 25 years ago, is very self-contained. There is a medium-sized Western grocery store with a bakery, deli, meat from Australia and other countries, fish, veg, drug store, liquor, etc. I’m sure I spent as much on groceries in our first two weeks living here as I did in two months in our Kennedy Town serviced apartment. I am gradually figuring out how to shop there less expensively. There are two bank machines, a mail box, a really good laundry/dry cleaning service, and a red telephone booth. The suites’ concierge is friendly and helpful as are our 24-hour security and the shuttle-taxi-traffic guys. To get in and out of town, we take a shuttle that runs from our apartment complex down the hill about 15 minutes to its first drop-off. In normal times, our shuttle would make two more stops in different areas, but that hasn’t been happening since the Occupy protests began and a big area has been closed to traffic. Many apartments in Hong Kong offer these shuttles, which generally run to key buildings or MTR stations. They come in all sizes; ours is a coach bus. The road to our apartment is narrow, two lanes and winding. One side is a sheer drop, the other rock. Sometimes I can’t look. We pass 40-story apartments at their base and then, a few hairpin turns later, look down at them. Yet our coach bus barrels up and down this road along with other buses and big vehicles, not to mention the Formula-One wannabes who drive the mini-buses here. 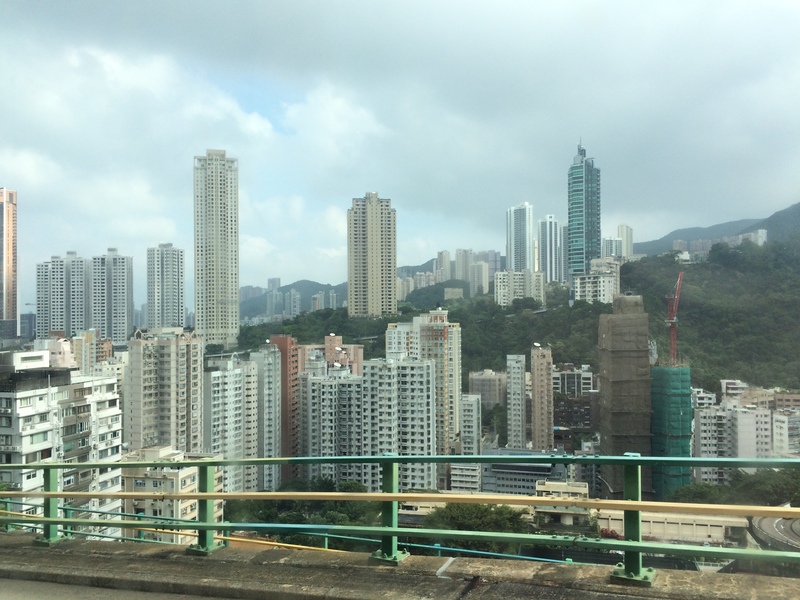 A view from the shuttle on the way down to our Wan Chai stop. I have learned that our complex was built and is owned by the Hwang family from Taiwan. Some of the family members live up here which, according to one staff member, means that they have to be on their toes in terms of standards. There is a large clubhouse up here, consisting of a gym with trainers and programs, five (I think) restaurants, meeting rooms, karaoke rooms (essentially entertainment rooms), indoor and outdoor pools, a library, a big kids’ area with climbing walls, etc., a spa and various other amenities. The interesting thing about the club is its art: there is a significant private collection of works ranging from ancient Chinese to contemporary; there are works by Renoir, Monet, sculptures and ceramics. It’s pretty amazing and there are various pieces all over the complex, both indoor and out. There is of course a fee for club membership, which gives you access to all its offerings and you then pay more to use all those offerings. The only real downside to HK Parkview is that we are really isolated. There is no running out to pick up some take-out or deciding between 40 restaurants in a three-block radius or wandering among shops and markets up here, which we so enjoyed in Kennedy Town. You have to get into a vehicle and go at least 15 minutes for any of that. I guess that’s pretty normal by Canadian standards, but it’s amazing how quickly you can get used to finger-tip access when you have it. I know we are lucky to live up here. 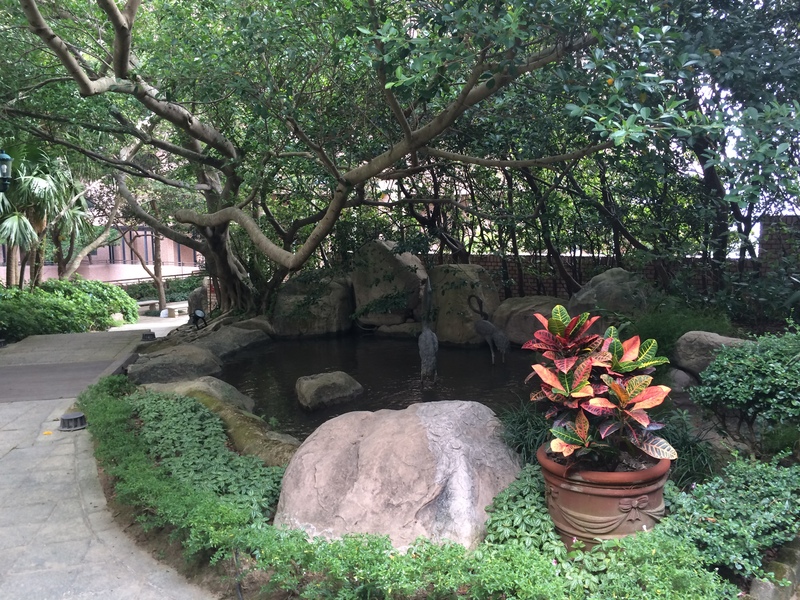 It’s lovely, quiet, an oasis from the bustle of the city. We have one of the smallest apartments here and are on the first floor of suites, which makes it more affordable. We are not on a big foreign-posting type of budget and have to be careful, but I’m glad we’re here. It’s still weird to think that this is our new normal. Oh well. Let the adventure continue! There are lovely gardens all over the grounds, with some random sculptures along the way.